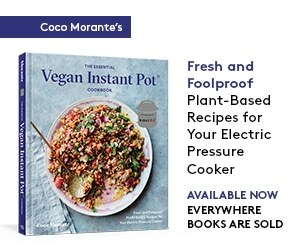 There’re just two of us in my household (well, three if you count the beagle), so it’s a challenge to cook the things I love in small enough quantities that we won’t be wasteful. With some recipes, it’s nice to have tons of leftovers — I’m always happy to have extra beef or chicken broth in pint-sized freezer containers, ready to defrost on the stove in a matter of minutes. Hummus is another story, though. It doesn’t freeze all that well, and the two of us can only eat so much of it. This recipe makes a fairly small batch of about two cups of hummus. However, it also makes a whole extra portion of chickpeas, which I can sprinkle into salads throughout the week or freeze for another week’s batch. While hummus itself doesn’t freeze well, chickpeas do very well in the freezer, especially when you’re going to blitz them up later. Any slightly compromised texture of the beans will be unnoticeable in the final result. This 2-quart dutch oven simmers with super even heat, perfect for cooking a little batch of chickpeas. Great hummus starts with dried chickpeas, soaked overnight and simmered ’til soft. There’s no need to be nervous about cooking chickpeas from scratch — it’s very easy to do well. I find them to be much more forgiving than other varieties of beans. They’re hardy little things, and frankly, it’s ok if they get a little bit overdone. Err on the side of overdone to make sure the chickpeas are a.) digestible and b.) will whip into a very smooth hummus. When I’m cooking my chickpeas I let them simmer for an hour, then start testing the beans for doneness every ten minutes or so. I do this by fishing a chickpea out of the cooking water and cutting it in half. If there is a lighter-colored chalky core, the beans need a while longer in the pot. If it’s a solid tan color all the way through, they’re done. Simple as that. If you’re planning to use up all your chickpeas within a few days, follow my lead and refrigerate them in glass jars, covered in their cooking liquid. To freeze the chickpeas, lay them out on a cookie sheet in a single layer, freeze them solid, then transfer them to a plastic bag and store frozen for up to two months. I was inspired to make this hummus thanks to a generous sample sent by Sesame King. They’ve recently come out with a line of flavored tahini — there are seven varieties in all. I made sure that there weren’t any suspect, unnatural ingredients before I agreed to try them out. Rest assured, all that’s included are sesame seeds, spices, salt, and a bit of citric acid for preservation. The Olive Oil variety also includes extra virgin olive oil. In particular, the Cajun tahini sounded fantastic, and I was not disappointed. The flavor reminded me of my favorite spice blend, without any overpowering heat (you can feel free to add a pinch of cayenne if you want a little more kick). Blended into the hummus it lent a subtle background of spice, along with that characteristic rich and bitter-in-a-good-way sesame flavor of high-quality tahini. Hummus with Gyro Meat for Dinner. The first night we’ve got homemade hummus in the house, it’s what’s for dinner. 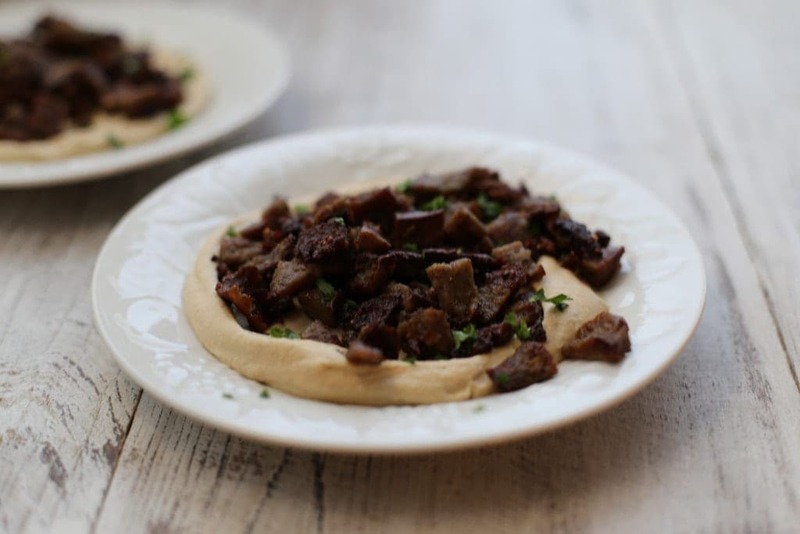 In classic Middle Eastern style, I spread a generous dollop on a small plate, then top it with seasoned meat and a sprinkle of chopped parsley. It’s a substantial main dish despite its small appearance, and it’s best scooped up with flatbread, bias-sliced cucumbers and carrots, and crunchy, spicy radishes. I first had this dish at Old Jerusalem in San Francisco, and it stuck with me as something I needed to recreate at home. With the short-cut of heating up some leftover gyro meat from last night’s dinner, it was ready in minutes. I’d love to make it again sometime with diced chicken breast sautéed with shawarma seasoning, olive oil, and a big squeeze of lemon. Thanks so much to Sesame King for the generous samples — I’m sure we’ll be enjoying lots more hummus around here! Make a reasonably-sized batch of hummus and have some chickpeas left over for salads throughout the week. 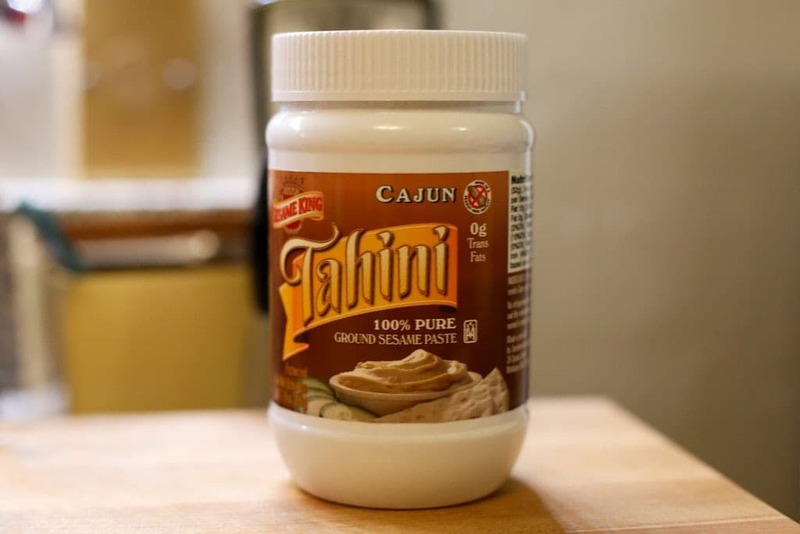 Cajun tahini spices things up for a change! In a medium (2 or 3-quart) saucepan, cover the chickpeas with water by at least two inches. Bring up to a simmer on the stove over medium-high heat. Turn the heat down to low, add the salt, and stir to dissolve the salt. 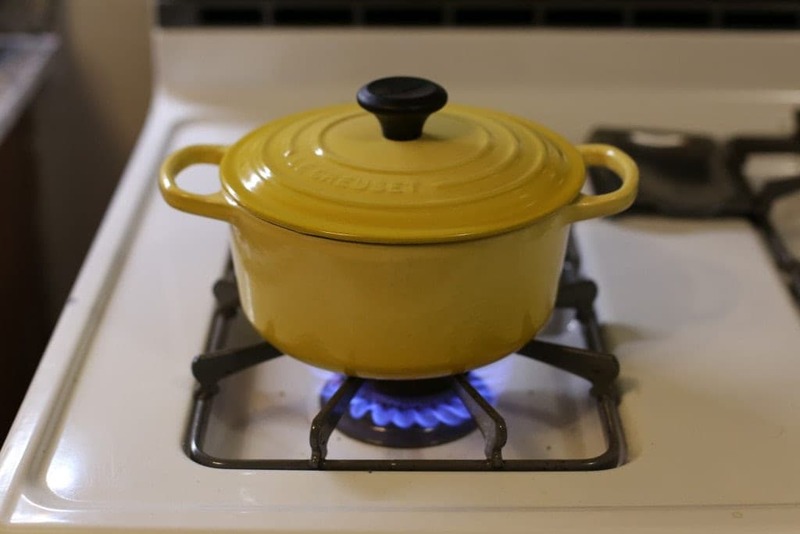 Cover the pot and let it simmer for an hour, making sure the heat is low enough that the water won’t boil over. After the hour is through, remove the lid from the pot and begin to check the chickpeas for doneness. You can do this by cutting a single chickpea in half — if there is any white, chalky center, it is not cooked through yet. Check every 10 minutes until the chickpeas are solid in color all the way through, and are soft and tender. Remove the chickpeas from the heat. Drain the chickpeas, reserving the cooking liquid, then store half of them for later use. If you will use them up within the week, refrigerate them in a jar, covered in some of the cooking liquid. If you want to store them longer, freeze them in a single layer on a cookie sheet, then transfer them to a plastic bag and freeze for up to two months. Place the remaining half of the drained chickpeas (250 grams cooked) in the container of a high-speed blender or food processor. 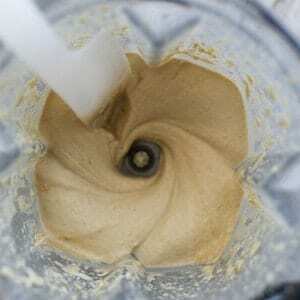 I use a VitaMix 750 for super-smooth hummus. If you are choosing between a regular blender and food processor, go for the food processor. Its wide container is better suited to processing thick mixtures. Add the tahini, lemon juice, garlic, and 1/3 cup of the reserved cooking liquid. 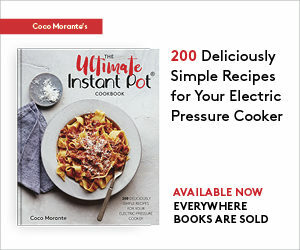 Process at high speed for about a minute, adding more cooking water by the tablespoon if the mixture is too thick to process and scraping down the sides of the container if necessary. Taste for seasoning, adding more salt or lemon juice if desired. 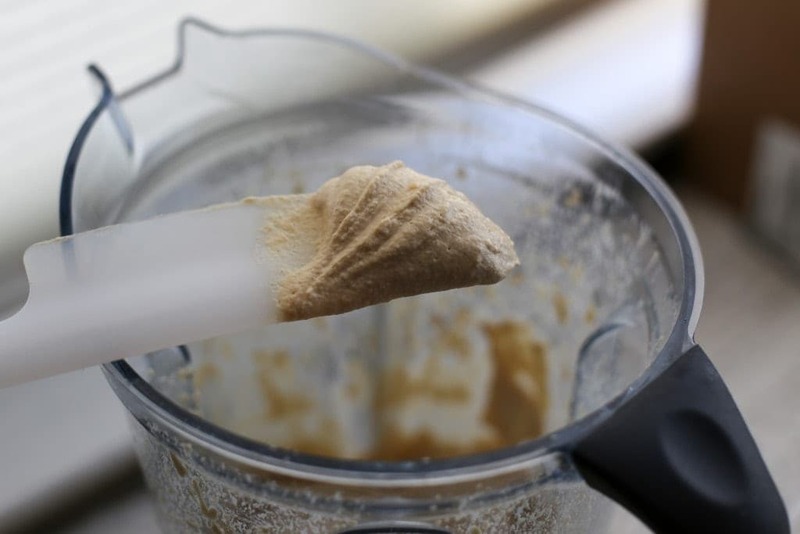 Transfer the hummus to a tightly-lidded container and store in the fridge for up to a week.